Circus Harmony Teaches “the Art of Life” | Kid Reporters' Notebook | Scholastic Inc.
Young people perform at Circus Harmony, a nonprofit social circus school in the heart of St. Louis, Missouri. “Circus teaches the art of life,” said Jessica Hentoff during my recent visit to Circus Harmony. Hentoff is artistic/executive director and founder of the nonprofit social circus school in the heart of St. Louis, Missouri. 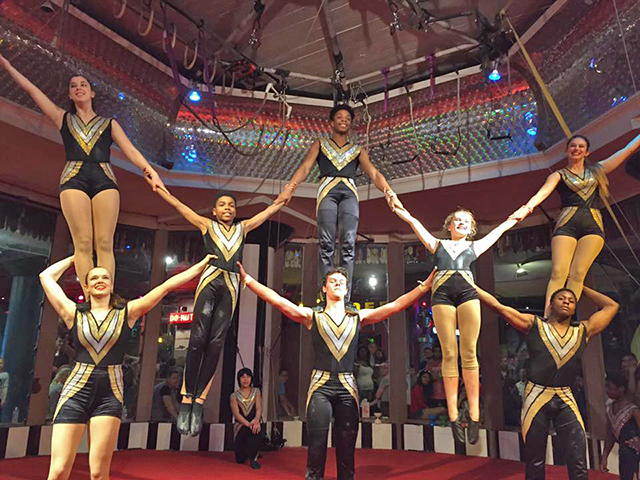 Founded in 2001, the school teaches circus arts and life skills. It has evolved from a group of 10 students performing 40 shows a year to more than 1,300 students performing more than 500 shows a year. The school has several outreach programs, as well as year-round circus classes. More than 70 percent of the young people who benefit from the program are from low-income communities. Circus Harmony students perform on the trapeze. The organization is based in the City Museum in St. Louis. Classes include juggling, unicycling, and trapeze. Some alumni have gone on to perform in renowned circuses, including Cirque du Soleil. “My favorite thing about Circus Harmony is that they open up a whole new world for anyone who wants to be in the circus,” says Sean Petric, a 15-year-old juggler.